This subcompact, available in 3-door and sedan models, comes standard with XM satellite radio, tilt steering wheel, and six air bags. 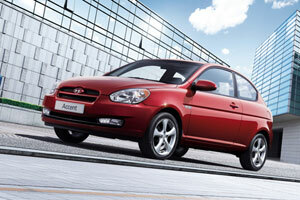 Both versions of the Accent carry a 110-hp, 1.6-liter 4-cylinder engine. With the standard 5-speed manual transmission, fuel economy is 27 mpg city/32 mpg highway, according to EPA estimates. A 4-speed automatic transmission also is available. 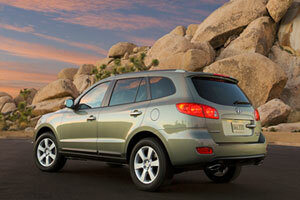 Several option packages add automatic cruise control for 2009, while the SE 3-door Premium package adds a sunroof. 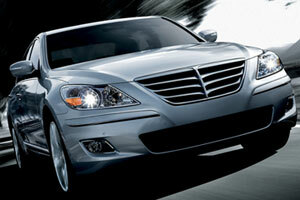 Hyundai's top-dog sedan until Genesis rolls into the garage, the Azera follows the automaker's pattern of offering more equipment for less money. That means 44 inches of front and 38 inches of rear legroom; steering-wheel audio controls; dual-zone air conditioning; and a 172-watt, 6-speaker stereo. A 3.3-liter V-6 engine that makes 234 hp motivates the Azera GLS, while the Azera Limited gets a 263-hp, 3.8-liter V-6 engine. Standard safety fare includes electronic stability control, traction control, anti-lock brakes (ABS) and eight air bags. 2009 changes include improvements to the Azera's steering and suspension, new 17-inch alloy wheels, revised wood and metal interior trim, and seven new paint colors, including Crimson Red Pearl. A new 5-door Touring model expands the Elantra lineup by year's end. 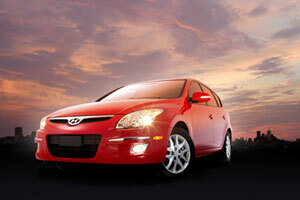 Hyundai says the market for 5-door hatchbacks doubled between 2001 and 2006. The compact car gets electronic stability control, a USB port and standard XM satellite radio. When the 60/40-split rear seats fold, cargo room in the Elantra Touring expands to 65.3 cubic feet. Both the Touring and the Elantra sedan feature a 138-hp, 2.0-liter 4-cylinder engine. A 5-speed manual transmission, and a 4-speed automatic is standard, while the Touring gets a B&M Racing sport shifter. The Touring gets a stiffer suspension setup than the sedan for a sportier driving feel. The Entourage minivan enters its third model year in 2009. Powered by a 250-hp, 3.8-liter V-6 engine, the long-wheelbase vehicle is sold in GLS and Limited trim levels. Standard equipment includes power sliding doors, a third-row seat that folds flat into the floor, and 3-zone climate controls. Rear-seat DVD entertainment and satellite navigation are available. The radio is upgraded for 2009, and XM satellite programming is now a standard feature. Three-row side-curtain air bags join other safety features including ABS and electronic stability control. On sale this summer, the all-new Genesis moves Hyundai into a more upscale territory. The RWD sedan comes with three engine choices; two 6-speed automatic transmissions; and front and rear independent suspension. 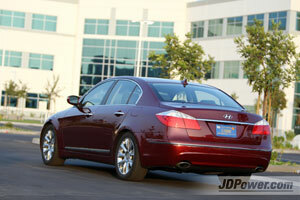 At 197 inches, the Genesis is a bit longer than most midsize cars. Wood trim and leather-covered, heated-and-cooled seats are standard. The engine lineup includes a 268-hp 3.3-liter V-6; a 289-hp 3.8-liter V-6; and the new 4.6-liter V-8 engine, Hyundai's first. Using regular gasoline and producing more than 360 hp, the V-8 Genesis gets from 0 to 60 mph in less than six seconds, according to Hyundai. The car gets eight air bags, electronic stability control, and electronic active head restraints, a first for a mainstream brand, Hyundai says. Hyundai says the Lexicon Discrete Surround audio system, with LOGIC 7 technology, is found on two models-the Genesis and the Rolls-Royce Phantom. Here, it is a 17-speaker, 500-watt stereo with a 12-channel digital amplifier. The Genesis also gets an HD digital receiver, and standard XM satellite radio. 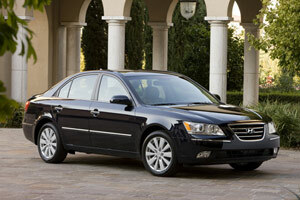 A USB/iPod auxiliary input jack as well as Bluetooth hands-free telephone are standard on the sedan. Found on all models of Hyundai's Santa Fe crossover utility vehicle (CUV) are V-6 engines; power windows, locks and mirrors; an AM/FM/CD stereo equipped for satellite radio and MP3 players; and air conditioning. The Santa Fe GLS gets a 2.7-liter V-6 engine that makes 185 hp; the SE and Limited models carry a bigger V-6 engine, measuring 3.3 liters and producing 242 hp. Standard safety fare includes six air bags and electronic stability control. New for 2009 are roof-rack cross rails on the SE and Limited models, four new paint colors including Willow Gray, and a more powerful base stereo. The best-selling Hyundai, the front-wheel-drive, midsize Sonata sedan, gets a substantial refreshening for the 2009 model year. Changes are made to the Sonata's cabin, to some exterior pieces including front and back lights and the grille, and to how the car drives. The biggest news, though, is under the hood. 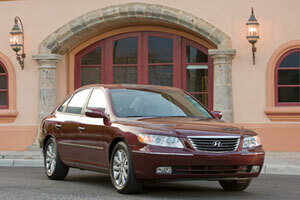 The second-generation of the 2.4-liter 4-cylinder engine makes its debut in the 2009 Sonata, now producing 175 hp. A 3.3-liter V-6, boosted to produce 249 hp, also is offered. The all-aluminum, 16-valve 4-cylinder engine has Continuously Variable Valve Timing (CVVT) on its camshafts, and a Variable Induction System (VIS). Besides power hikes, gas mileage improves to 22 mpg city/32 mpg highway. A 5-speed manual transmission is standard; a new 5-speed automatic transmission with Shiftronic is an option. The aluminum V-6 engine adds a variable intake system for 2009, which makes for better standing-start acceleration and passing power, Hyundai says. A 5-speed automatic transmission with Sportronic is standard. The Sonata's redesigned cabin gets a new center console and instrument panel with blue back-lighting, a nod to Hyundai's Veracruz crossover utility. Dual-zone air conditioning and front-seat warmers are now standard. Classified as a large car by the EPA, the Sonata has a 16.3-cubic-foot trunk. A USB port accommodates both iPods as well as flash-drive memory sticks. Electronic stability control (ESC) is standard fare on all Sonatas. Six air bags-dual front, side and side-curtain-are standard. The Sonata SE, with either the 4-cylinder or the V-6 engine, gets a B&M Racing shifter with the manual transmission; 17-inch alloy wheels with more all-season tires with stiffer sidewalls; fog lights; and a rear spoiler. The Sonata Limited gets leather seats, an Infinity 6-speaker stereo with a 6-disc CD changer, and a power sunroof. Sonata GLS and Limited models get a more agile ride, thanks to a new multi-link rear suspension setup. Sway bars are larger, spring rates are increased and even shocks get revised valves. It results in better handling and a quieter ride, Hyundai says. The SE gets a sport-tuned suspension. 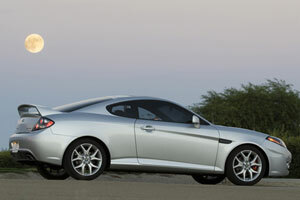 The sportiest Hyundai model, until the arrives in 2010, the Tiburon coup_ comes in 4- and 6-cylinder models. All Tiburons come with power accessories, air conditioning, 16-inch alloy wheels, and a 200-watt Kenwood stereo. A 138-hp, 2.0-liter 4-cylinder engine gets 28 mpg on the highway. GT Limited and SE models come with a 172-hp, 2.7-liter V-6 engine. The Tiburon SE gets a ZF 6-speed manual transmission, sport-tuned suspension, red-painted brake calipers, and electronic stability control. Buyers of the Tucson CUV have plenty of choices: 4- or 6-cylinder engines; front- or all-wheel-drive; manual or automatic transmission. An AM/FM/CD stereo with three months of XM satellite radio is standard. Active front headrests better protect against whiplash in a rear collision. 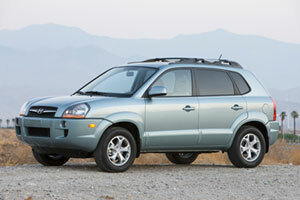 For 2009, most Tucson engine/transmission combinations see a small fuel-economy boost. The vehicle's grille and 16-inch alloy wheel get design tweaks. SE 4WD models get heated front seats and a windshield wiper de-icer. 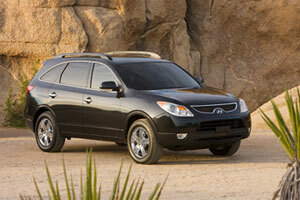 Hyundai's largest CUV, the Veracruz competes against such vehicles as the Mazda CX-9 and GMC Acadia. 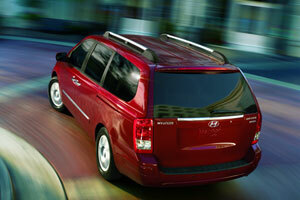 Standard on the 7-seat, 3-row Veracruz are air conditioning, satellite radio and 17-inch wheels. The top-line Veracruz Limited has power-adjustable pedals, leather seats, dual-zone air conditioning, and an Infinity stereo system. Three rows of side-curtain air bags plus anti-lock brakes and electronic stability control top the safety lineup. Options include a navigation system and rear-seat entertainment. New features for 2009 include a standard USB port and auxiliary jack and the availability of black leather seats on the Veracruz Limited. The Veracruz SE has been dropped.